It is that time again! Are you ready for Block #8? I can tell you it is a beauty for sure. But first, take a look at the first seven blocks all together. They are fantastic together, aren't they? To see variations from everyone who is participating, take a look at the Flickr Group. I love what everyone has done! 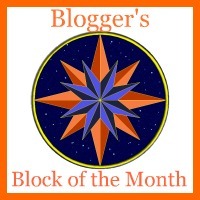 If you are just starting, you can get ALL the links to the instructions for each block over on my right sidebar... under the heading Blogger's BOM Block links. Block Number 8 is brought you by the fabulous Amy of Mrs. Schmenkman Quilts. This block is a beauty. So hop on over there and grab your instructions and start sewing!! If you would like to see the original post about the BOM and the rules, just click here. Don't forget to post your new blocks to the Flickr Group.